Updated 11:30AM, Thursday March 1st, 2012	by Sam Hailes, Christian.co.uk Be the first to comment! 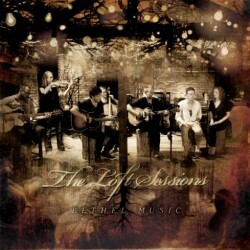 The Loft Sessions is the latest offering from American mega-church, Bethel. Featuring worship leaders including Brian and Jenn Johnson and Jeremy Riddle, the album has an eclectic mix of voices and instruments. The album has a great sound to it. Banjos, hand claps and lots of vocal harmonies make for a rustic, laid-back feel that is missing from the majority of worship albums. The Loft Sessions appears to take inspiration from Hillsong Chapel. There are obvious similarities: A mixture of live and pre-recorded elements, big anthemic songs re-arranged for an acoustic setting and even the fact that both albums come with a bonus DVD. Surprisingly, Brian Johnson, the worship pastor at Bethel says he has never seen or heard Hillsong Chapel. Perhaps he should…? Because if you liked what Hillsong did with their chapel, you’ll love what Bethel did with their loft. The Loft Sessions is not strictly acoustic. Although powerful drumming is rare, it does make an appearance. Rather, the album is best viewed as a reinterpretation of the church’s songs, stripped back and expressed in a new format. Nothing on the album is expected or in any way predictable. First song One Thing Remains has a fresh vibe to it, filled with “ooh”s and a gentle acoustic guitar. Even the melody line has been slightly adjusted to fit with the outstanding musical arrangement. The song has already been used across the world as churches pick up the infectious “Your love never fails / Never gives us / It never runs out on me” chorus. The new arrangement does total justice to the original brilliance of the song. My Dear is a fantastic new song from upcoming worship leader Hunter Thompson. I have to admit I was convinced the vocals were led by a woman, but it turns out Hunter just has a high, and very distinctive voice! Referring to God as “my dear” will grate on some. Bethel’s philosophy has been to write lyrics from the heart and to not shy away from emotion. In an interview with Christian.co.uk Brian Johnson said “I honestly think that people freak out too much about whether it’s biblical or not.” It’s a controversial thing to say, but explains why many of Bethel’s lyrics are unusual. There’s a power and beauty to Jenn’s voice that coupled with sensitive keyboard sounds makes for an emotive and heartfelt song. Jeremy Riddle’s Walk in the Promise is the loudest song on the album. Starting with atmospheric reverb filled vocals and background cello playing, the song builds into “we lift you up” where the cymbals crash in and everyone’s voice soars. Angels is a somewhat puzzling song. “Calling the watchman angels on the walls to come and sing with us” could be interpreted symbolically or literally. When we asked Brian Johnson which it was, he seemed unsure. The album closes with some slower numbers by Jeremy Riddle before Matt Stinton brings everything back to life with This Is What You Do. Matt’s voice is outstanding. There’s a great simplicity to the album in general, but especially with this final track. The combination of a very basic drum beat and strong strumming of the guitar make for a surprisingly energetic finish. Not only are Bethel’s worship leaders excellent singers, but their voices have been handled with exceptional care in the production process. The depth and clarity to each voice is outstanding. It’s almost as if they are in the same room as you. Bethel have done their best to create an intimate surrounding for the recording. There weren’t more than 100 people in the loft when it was recorded. It was always going to be difficult to communicate that same sense of closeness on a DVD and CD, but the team have risen to that challenge. The DVD is a mixed bag. On the positive side, every song on the album is included and it does well in capturing the special atmosphere of the evening. There’s also 10 minutes worth of bonus features with a look behind the scenes. On the other hand, every vocal has been overdubbed meaning the worship leaders mouth will not be in sync with what you are hearing. The same can be said of much of the music, revealing just how little was really recorded live. Overall this album should be praised for its creativity, fresh approach and outstanding production. There’s plenty to be enjoyed and little to be criticised. The Loft Sessions is one of the best albums of the year so far.